Shopping for shoes isn't one of my favorite pastimes. When you have a pair of size 34 (or UK 1) feet, there's just no point looking at beautiful shoes since NO shop will stock shoes this small. To torture myself, I joined the masses and headed off to Harrods and Selfridges during the Boxing Day sale. It was almost painful seeing rows and rows of Jimmy Choo, Lanvin, Louboutin, Sergio Rossi heels/flats in every shape and form and knowing that I can't buy them. Meanwhile, dear younger sis is having the time of her life (she has normal sized feet) trying on these beauties. I've put up with incredulous looks and snickers from sales associates. I politely decline to shop at the children's department. And no, I'm not kidding about my shoe size either. Years ago, I read somewhere that feet often grow 1-2 sizes during pregnancy. That was enough to convince me to start having kids. Yes, I can be that shallow. I patiently waited for my feet to swell and well, grow. 9 months later, I have no problems fitting into my old shoes. 4 years after my pregnancy, I'm still a size 34. Liar! One can't imagine my relief when I discovered Repetto ballet flats. Their shoes are tiny! Size 35 equals to size 34. They mold to your feet and are incredibly comfortable. In additional, they're chic and goes with skinny jeans and dresses. For the last two years, I've been hankering for a pair of deep red flats. None were to be found in my size. When one popped on eBay.fr in MY size, I begged the seller to ship to the UK. Without much ado, here are my new long awaited flats. They're amazingly comfy, aren't there? Where did you get yours? 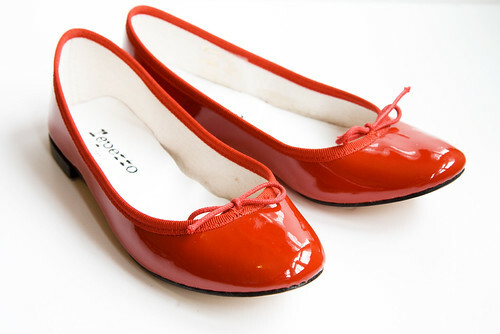 It was almost impossible to find Repetto anywhere in London.